We picked the theme of being and becoming for our winter KCC for many reasons. Among them, who are we as a nation being in this time of uncertainty and seeming regression into tribalism? How can we become the people, both individually and collectively that we aspire to be? What is that aspiration? Winter can be used as a time for reflection and contemplation and we ask that you come prepared to enter into that way of being. And discover who we can become together. This weekend will be a spacious healing journey and exploration. An opportunity for seeing each other and feeling seen. A time for deep dive story sharing, and receiving reflections from kindred spirits. An intimate opportunity to share and hear each other from different life stages. What gifts are you recognizing at this stage of your life? What aspects of your life are fading? How are you being in relationship with these stages? What is bringing you hope? What is your next stage? Who are you becoming now? These are just a few questions to ponder as you prepare to come and join us in a facilitated experience of safe, courageous vulnerability, where we may choose to take the risk of being who we truly are. It is also a time to lighten up, play and celebrate. Open, free space in which to enjoy quality time within our community, or recharge time on your own. A place for being and becoming. A roaring fire and roaring laughter. Great food and even better company. You’ll love who’s here. Still cooking with the yummy sauces that were served from the last KCC gathering. The venue, the weather, the delicious food, the loving embrace of each other, the high falls, the colors, the music, the easy flow of the design and the gifts of discovery and learning. A great harvest. thank you all for being a part of it. Thanks to all for a great day and for feeling welcome with the beautifully Bonded KCC family. I am more clear and dedicated to my next stage as a painter and have a big urge to do it in unheard of ways through a lens of sustainability. 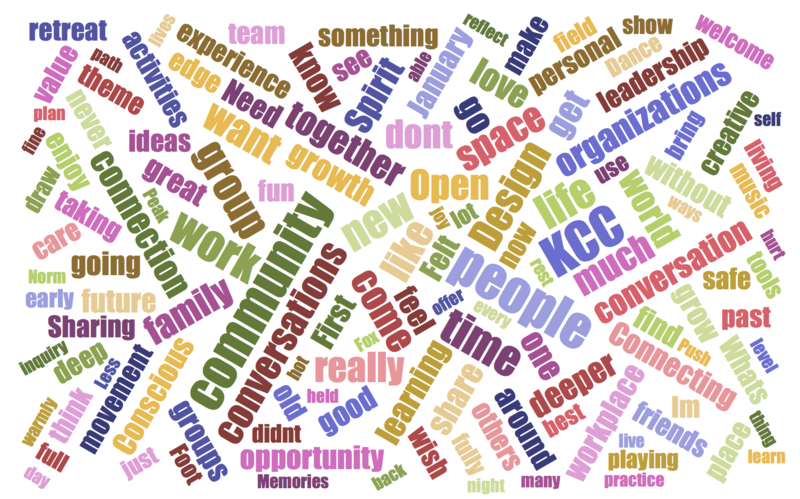 I have deep appreciation for KCC and its original focus of bringing Spirit into the Workplace. From the very beginning my experience of the KCC weekends has been to connect with and be inspired by other like-minded people regarding spirit and the workplace. The community and events nourish my heart and being so that I can go into the world with the work I am called to offer with more clarity.